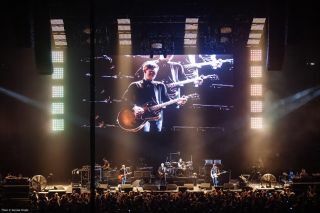 XL Video’s new Radiant MC-18 Hybrid LED screen is on the road for the first time in the US with the Kings of Leon on their “Mechanical Bull” tour, where it was specified by Production Designer, Paul Normandale. XL Video Disply close-up; Photo credit - Rachael WrightThe 74 ft wide by 38 ft high Radiant MC-18 Hybrid screen is used at the back of the stage, showing playback visuals created by the tour’s Creative Director Casey McGrath and the Kings of Leon team, combined with IMAG footage directed by Video Director, Phil Woodhead. Normandale specified the screen because the band - who have been judicious in their approach to integrating video into their live shows – this time around wanted a massive upstage LED screen. Having seen a plethora of big screens over the years, he was keen to use a product that would bring a proper three dimensionality to the stage and really stand out from the minefield of LED surfaces available.The 2:1 aspect ratio of the screen is to enhance the cinematic feel of the performance space. He received a demo of the MC-18 Hybrid from XL’s Project Manager Phil Mercer in the UK, and then went ahead and added it to his spec. The screen features a standard medium 18 mm pitch comprising 32 x 32 pixels per panel, with 4 x 4 higher brightness (7700nit) low resolution pixels also embedded in the same panel, which gives shimmery and mysterious effects. XL’s camera package consists of three operated Sony HXC-100 HD cameras, one positioned at FOH, one in the pit and one hand-held onstage, plus a four-way Bradley Cam-Ball 2 robo cam system with units dotted around the stage. All these feeds go into Woodhead’s GV Karrera PPU / vision mixer – one of XL’s new systems - and are output to the screen from there. A Catalyst media server feeds the playback content to screen, operated by Anthony Cairns. XL’s crew are Engineer Seth Sharpless, PoleCam Operator Steve Jones and LED Techs Chris Isaacson and Michael Cordier.